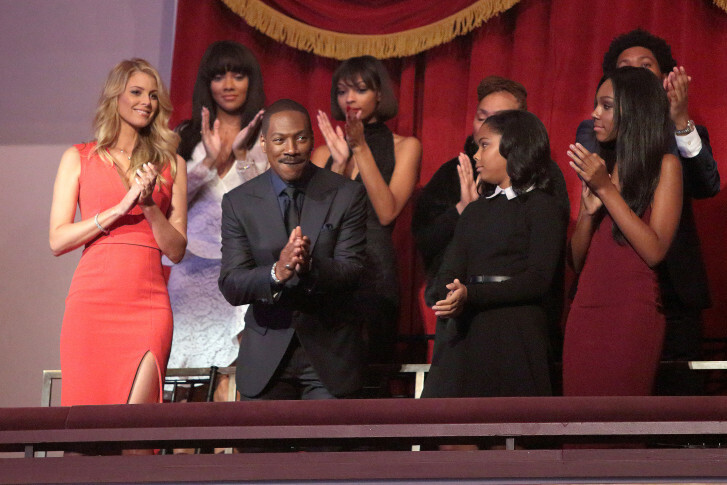 The Kennedy Center gave its 18th annual Mark Twain Prize for American Humor to Eddie Murphy. The Kennedy Center for the Performing Arts played host to an event on Sunday night that honored Eddie Murphy. 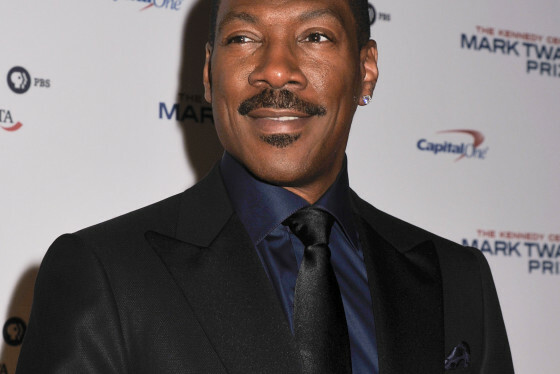 WASHINGTON — It was a raw Sunday night at the Kennedy Center as celebrities paid tribute to legendary actor and comedian Eddie Murphy. Murphy was awarded the 18th annual Mark Twain Prize for American Humor, an award that has gone to such comedy titans as Richard Pryor, George Carlin, Lily Tomlin, Steve Martin and Carol Burnett. If you were left wanting more from his recent “SNL 40” cameo, Murphy came out swinging during his acceptance speech, dropping “f” bombs and “n” bombs amid a spot-on Bill Cosby impression that left the Kennedy Center audience in stitches. “I better stop before I get carried away,” Murphy joked to the crowd. It was a long-anticipated release from Murphy, who spent the rest of the show up in the Concert Hall balcony watching clip packages and hearing memories from fellow comedians. The 19-year-old Murphy joined “Saturday Night Live” during the Jean Doumanian doldrums before creator Lorne Michaels returned from a five-year hiatus. During these dark days, many credit Murphy with saving “SNL” from certain cancellation with a string of hilarious characters, from Gumby to Buh-Weet, Mr. Robinson’s Neighborhood to James Brown’s Celebrity Hot Tub Party. “SNL” colleague Joe Piscopo, who played the Frank Sinatra to Murphy’s Stevie Wonder in a famous “Ebony and Ivory” spoof, said Murphy’s talent was obvious from the start. Murphy would show up on Christmas morning bearing gifts when he started making money. No, he wasn’t dressed as Santa Claus, though a red leather Santa suit is fun to imagine, considering it was Murphy’s wardrobe of choice during his iconic stand-up special “Delirious” (1983). Around the time of “Delirious” (1983), Murphy also began acting in massive movie hits, from “48 Hours” (1982) to “Trading Places” (1983) to “Beverly Hills Cop” (1984). Griffin says it’s rare for comedians to make that leap, let alone launch multiple movie franchises. “Creating roles from ‘Beverly Hills Cop’ to ‘Shrek’ that people talk about all the time, that is no small accomplishment for a comedian. And to be nominated for an Academy Award, that’s also unusual for a comedian. He’s just done so many things that most comics aren’t able to do,” Griffin says. Current “SNL” star Jay Pharoah first remembers Murphy in “The Golden Child” (1986). “He was making noises! I said, ‘You can get rich making noises?’ I was like ‘Yes! '” Pharoah tells WTOP. As for “Daily Show” host Trevor Noah, his first Murphy experience was “Coming to America” (1988). In that film, Murphy and co-star Arsenio Hall play multiple characters with the aid of prosthetics, the gimmick that convinced Hollywood to greenlight the movie after an unsuccessful initial pitch. Murphy returned to the “multiple roles” concept in “The Nutty Professor” (1996), playing not only the shape-shifting lead of Professor Klump and his skinny alter-ego Buddy Love, but also the entire Klump family for a memorable dinner table scene of passing gas amid pop culture references. “Most people are just happy to play one. He played the whole movie,” Griffin adds. In this unique way, Murphy joins the ranks of Peter Sellers, who played multiple roles in “Dr. Strangelove” (1964), and Mike Myers, who played multiple roles in “Austin Powers” (1997). It was Myers who teamed with Murphy for the ogre and donkey tandem in DreamWorks’ “Shrek” (2001), which won the very first Academy Award for Best Animated Film. After helping bring home the hardware for “Shrek,” Murphy earned an Oscar nomination of his own for his role across Beyoncé, Jennifer Hudson and Jamie Foxx in the musical “Dreamgirls” (2006). The Kennedy Center’s Mark Twain Prize ceremony airs Nov. 23 on PBS. So set your DVR. It’s your chance to finally see Eddie Murphy “raw” once again.